If you enjoy being driven mad by not being able to remember who sang the song you are listening to then you will love a Harwich Society Music Quiz! 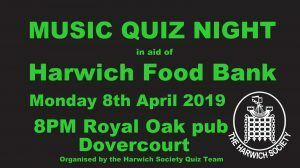 The Harwich society Quiz Team runs a number of music quiz nights throughout the year for various local good causes and the next one will take place on Monday 8th April in aid of the Harwich Food Bank. Each quiz consists of 100 pieces of popular music from the 1960’s through to the present day and all you have to do is write down who the artist is. These music quizzes have become very popular and always result in an evening of singing and laughter. The quizzes take place in the Acorn Room at the rear of the Royal Oak public house and begin at 8PM. It is for teams of up to 8 people at £2 per head.